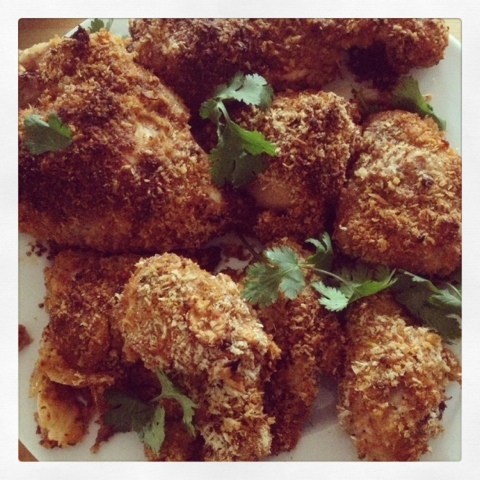 Sunday supper this week was a healthier version of fried chicken :) Yes I just went there and I'm sharing the recipe so you can enjoy it too. Heat oil in large frying pan to 350 degrees. Whisk eggs in medium sized bowl. Combine all dry ingredients in large bowl and mix well. Dip chicken in whisked eggs. Coat/cover chicken with dry mixture and place in hot oil. Allow both sides to brown (about 2 minutes on each side). Place drying rack or foil on sheet pan and assemble chicken on the rack/foil so there is space between all pieces. Place in 400 degree preheated oven for 10-15 minutes. Remove and enjoy! I added about a 1/2 cup panko bread crumbs (not paleo) and a yellow onion to the "dry" mixture and allowed the brine to marinade over night to enhance flavor. We enjoyed the fried chicken with a homemade cabbage salad and bottle of vino. It was a bit time consuming, but very easy to make. I would suggest making this dish during the weekend. You better believe I will make the fried chicken again -- maybe for night Sunday/Monday football.